The EZM 10 is the result of an ambitious development project that was initiated in 2003. 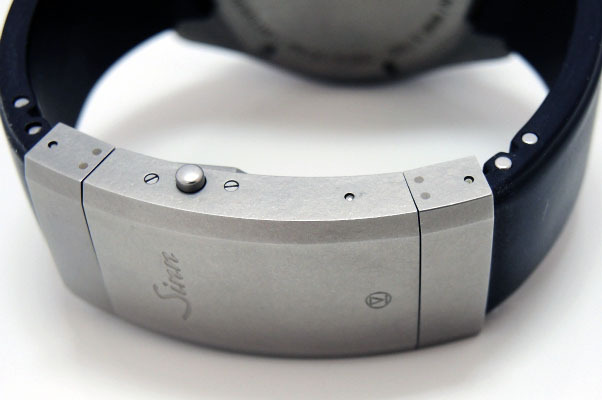 Throughout the entire time, our stated objective was to improve both the movement and the features of the watch. 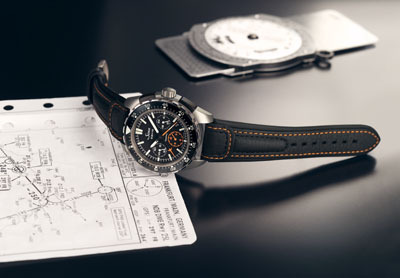 In constructing this new timepiece, our engineers pursued a challenging goal – namely to create a mission timer that optimally implemented the demands made on a pilot’s watch in terms of movement, dial and technology. 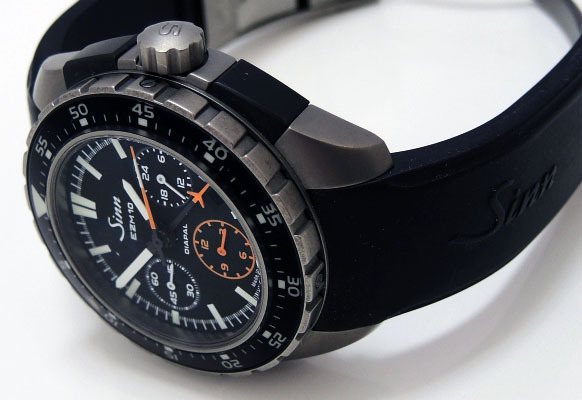 Easy legibility is one major reason pilots rely on mechanical watches. 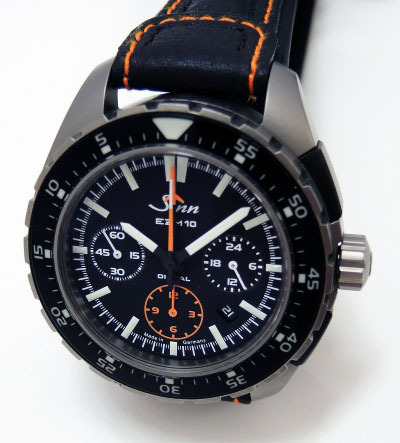 That is why these chronographs are made using the SINN SZ 01 movement that facilitates precise time measurement and excellent readability. 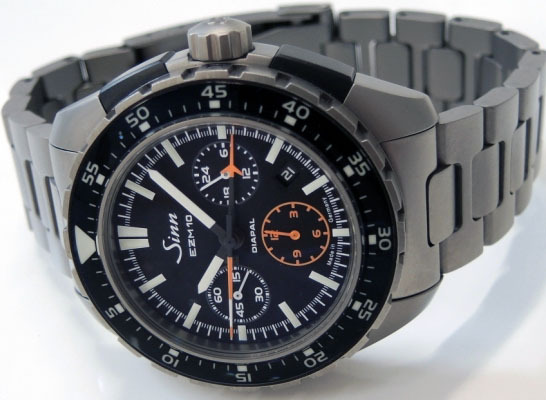 The SZ 01 features a 60-minute jump minute counter in the centre of the dial. This technical innovation has two benefits: For one thing, 60 instead of the conventional 30 minutes are counted in one sweep of the hand. In addition, the minute-counting hand extends across the entire radius of the dial, making it easy to tell how much time has passed. 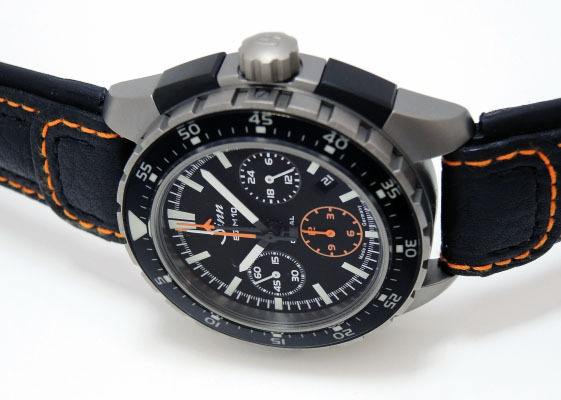 Orange lights visible even in daylight indicate the functions of the chronograph. This makes it possible to read off stopped times even in the dark or in ultraviolet light, which is often used in cockpits. To ensure optimal functionality, the backwards-counting rotary pilot’s bezel with minute ratcheting has a luminous marking. Like all our pilot’s watches, the EZM has a captive bezel, but with an added luxury: The bezel insert is made of high-quality sapphire crystal glass. 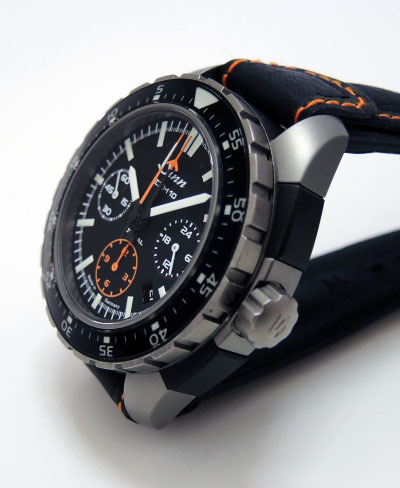 But excellent readability is not the only aspect than makes the EZM 10 such a valuable and useful mission timer. 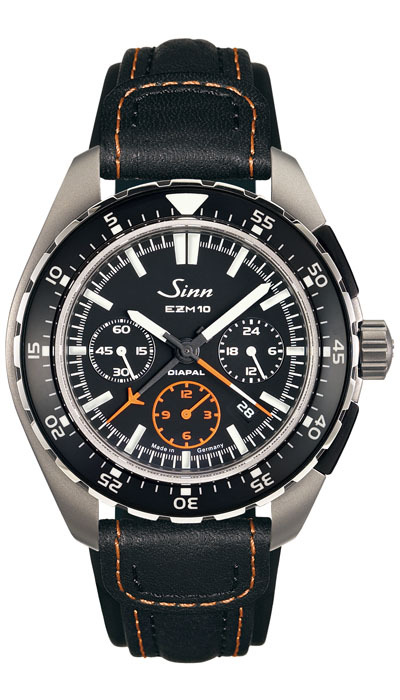 The timepiece also boasts excellent SINN technological features such as DIAPAL for a lubricant-free escapement, Ar-Dehumidifying Technology for better resistance to humidity and freedom from fogging, as well as temperature resistance technology that ensures workability at temperatures from -45 °C to +80 °C. 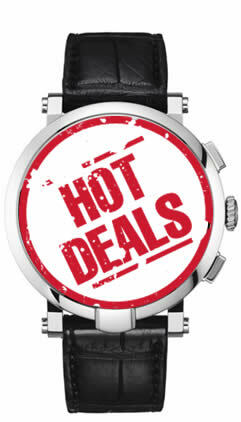 And the large-format push-pieces with Black Hard Coating on a tegimented surface are also extremely user friendly. 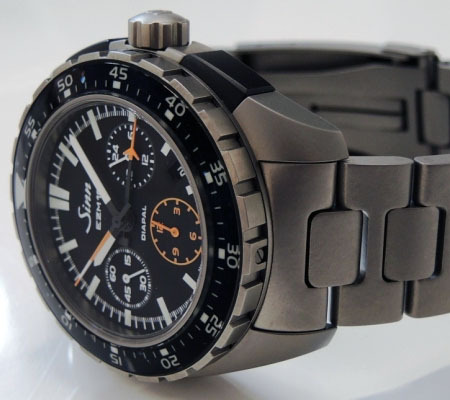 They facilitate convenient operation of the chronograph, even with gloves on. The push-pieces are attached without screws and effectively sealed using our specially developed D3 system. 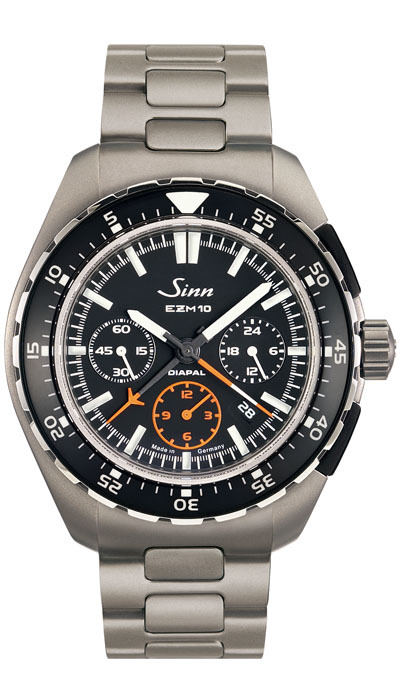 The case diameter of 46.5 mm gives the watch a formidable appearance, yet it is still comfortable to wear – not least because of its bead-blasted case made of robust titanium with TEGIMENT technology, which is used here for the first time in a SINN watch. 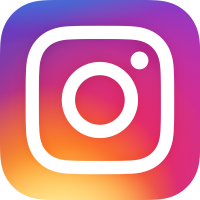 The crystal is made of valuable sapphire crystal glass with anti-reflective coating on both sides. 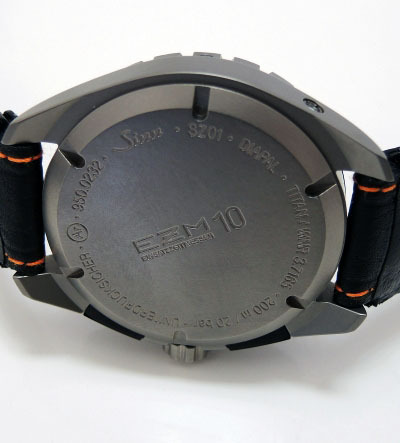 With the EZM 10 we have succeeded in developing a distinctive pilot’s watch with excellent performance, suitable for everyday use, that is also resistant to low pressure and high pressure up to 20 bar. 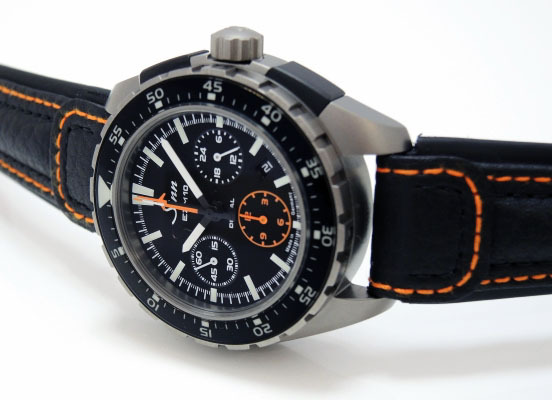 Thanks to its extraordinary technological characteristics, we offer a five-year warranty for this chronograph.